Diary of Florence M.E. Davies from Nercwys, Flint recounting her work as a doctor in China 1928 - 1939, found in second hand bookshop in Llandudno. Florence buried in Nercwys. She was the daughter of the Rector of Nercwys. She trained but initially failed her medical exams, but moved to practise in China for this period, during a period of war. Descriptions of her life in China and Wales, compares flora and fauna, politics, etc, and her friendships with women. She also wrote some poetry. She came back to Britain to practise, and worked until her old age. 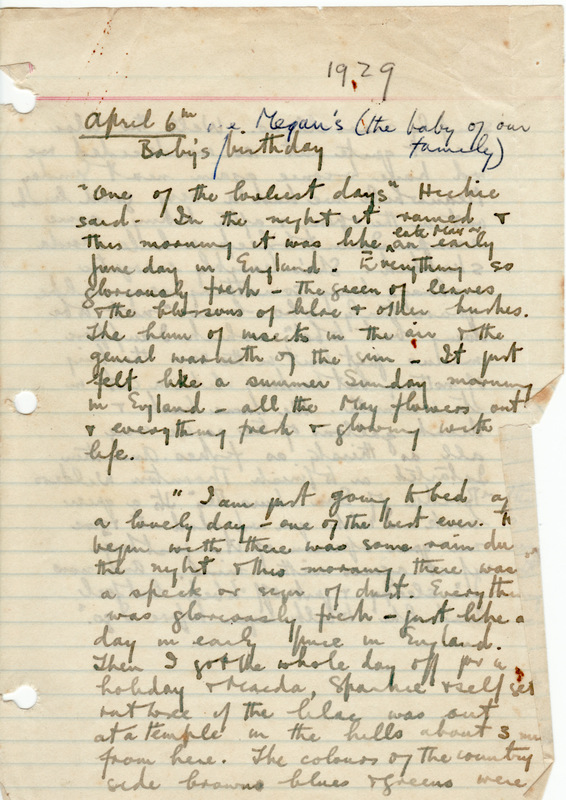 Page of Diary - 6 April, 1929 in China. Deposited at Flint Record Office.